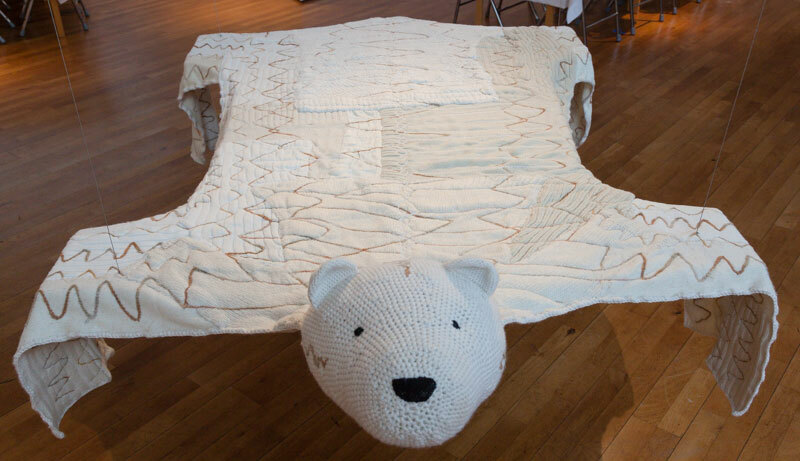 In our home town Linköping, the County Museum has a juried exhibition of craft, art, sculpture and textile. It will be open until Jan 11th, 2015. 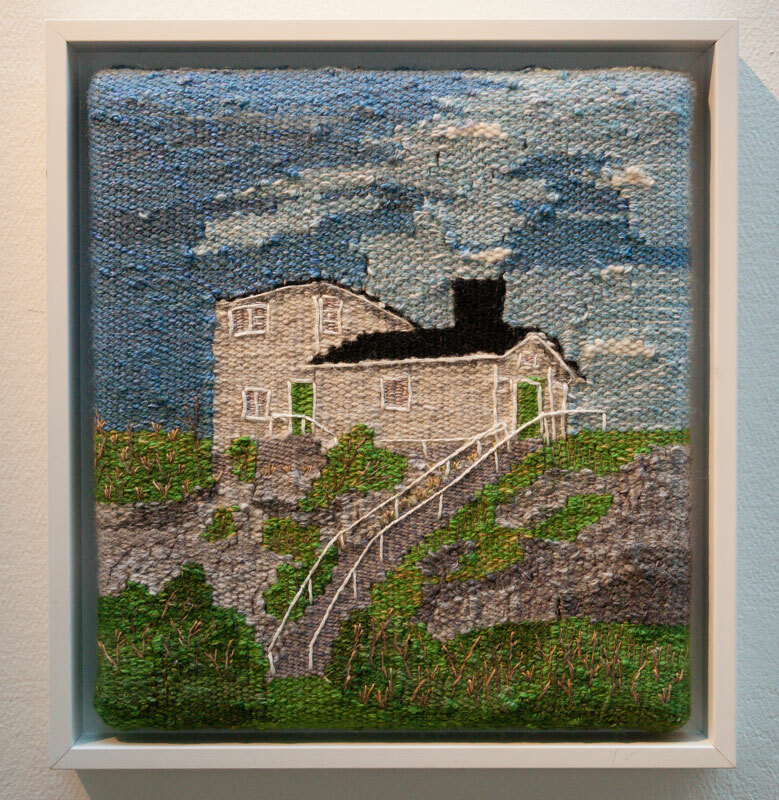 First an embroidered train “Lakvik” by: Lena Djurström, Risten Lakviks Järnväg, Kerstin Hanstorp, Kerstin Jacobsson, Yvonne Oscarsson, Judit Rogulla, Gunvor Wäreborn, Carin Ängmo. Annika Rudholm, known from Vävmagasinet has made two “ripsvävar” (repp) in paper and other material. 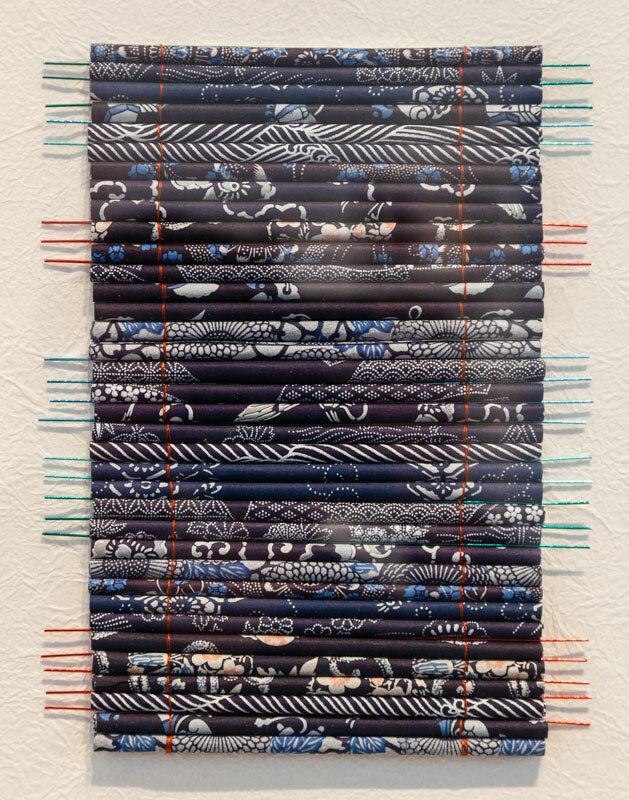 “Candy”, double weave with rags, by Gabriella Lundqvist, Linköping. 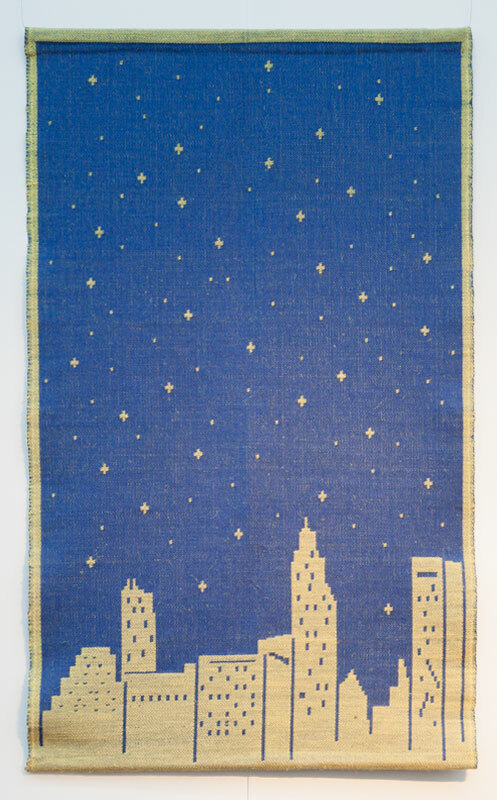 Ulla Thorell, Linköping has woven a monks belt with glittering inlay: “Vinternatt” (Winter night). 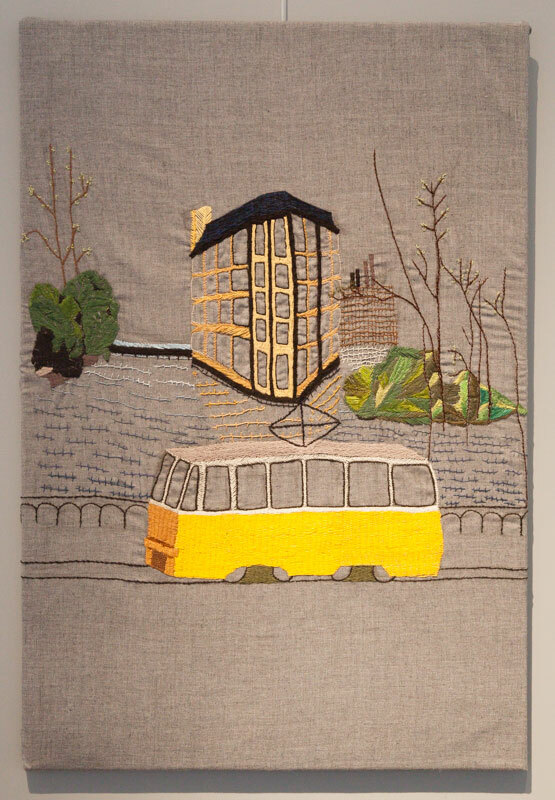 Last but not least: A classical view from the bridge of Kungsgatan in Norrköping: a tram and the amazing building “Strykjärnet” ( The Iron) “Spår i staden” (Tracks in the city), embroidery by Jenny Sundström. Till next week, have a nice weekend and enjoy yourself! 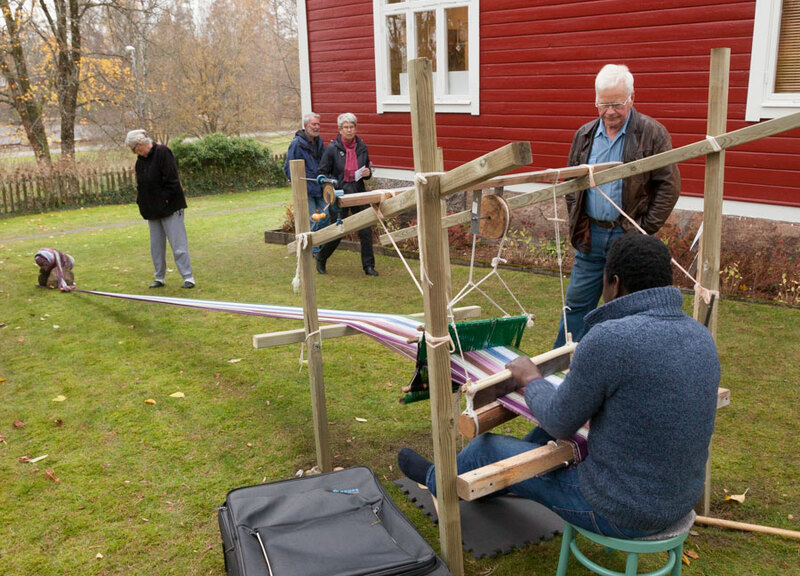 Here some pictures from the Weaving days in Glimåkra. Lots of visitors as usual! started weaving less that 2 months ago! ), and a picture of Mette Frøkjær, Denmark. 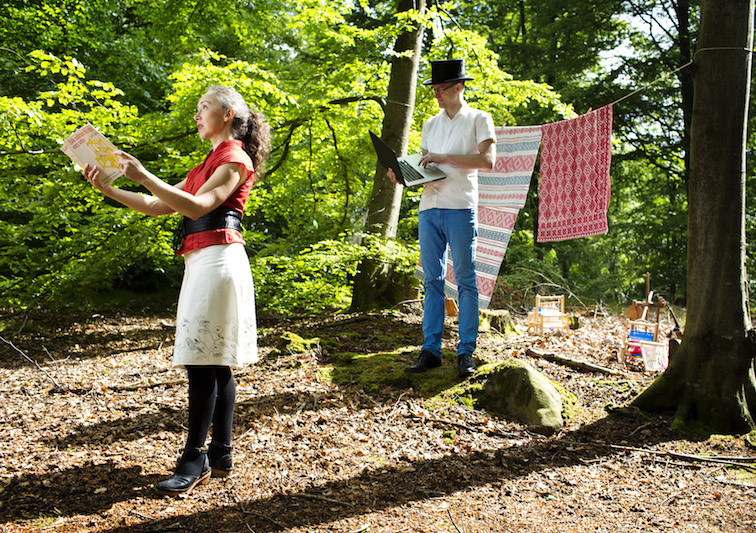 Press image for the Textile Sounds festival with the initiators Lisa Hansson and Stefan Klaverdal. Scene from Den Lilla Vävoperan (The Little Weaving Opera). Photo: Daniel Nilsson. 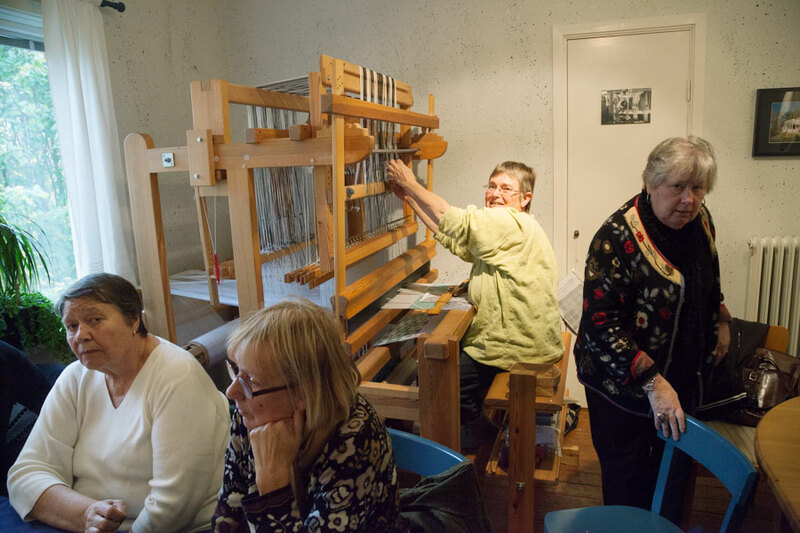 Music from a sewing machine, infrasound, conductive thread, Syntjuntan och sound waves – just a few examples of what got the air vibrating during the Textile Sounds festival, arranged last weekend at the Textile Museum in Borås. 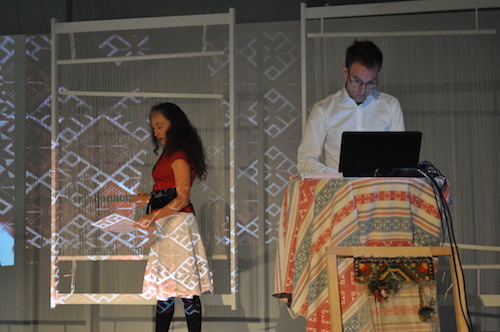 The world´s first festival for textile sound art, according to its initiators Lisa Hansson and Stefan Klaverdal, who also have created The Little Weaving Opera. Four days of concerts, workshops, performances and installations combined struck a multi-faceted artistic chord, one that will no doubt set up ripple effects for some time. 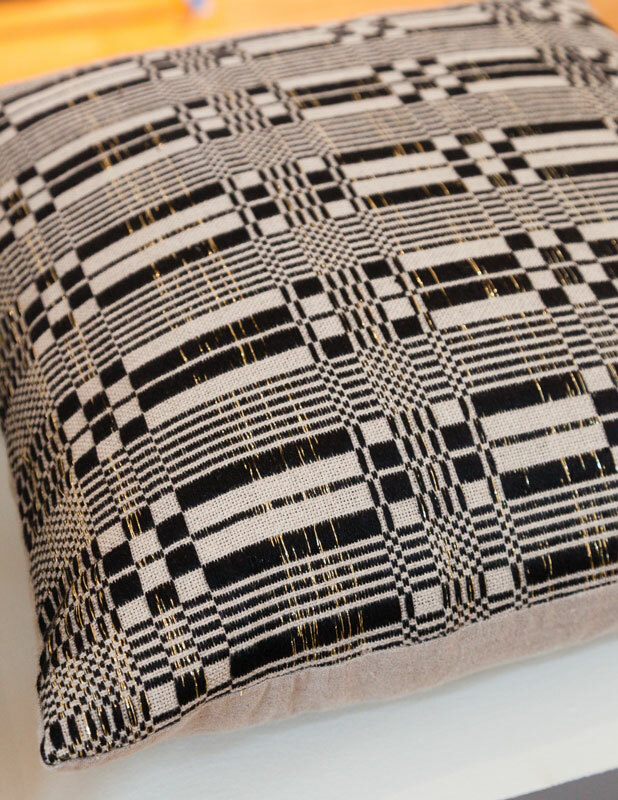 Many of the pieces dealt with the commonality between textiles and sound. Concepts like rhythm, repetition and pattern can be found in both fields, for example. 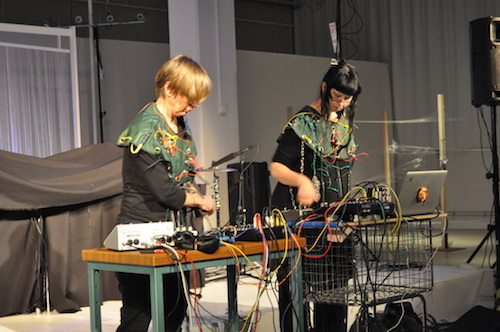 Other pieces were about sound waves, conductive thread, lilypads, sensors and sampling: the theme broadened to sound, textiles, human beings and technics. Can you draw a line between people and music, cells and technics? Between skin and membrane? Beween thread and music wire? 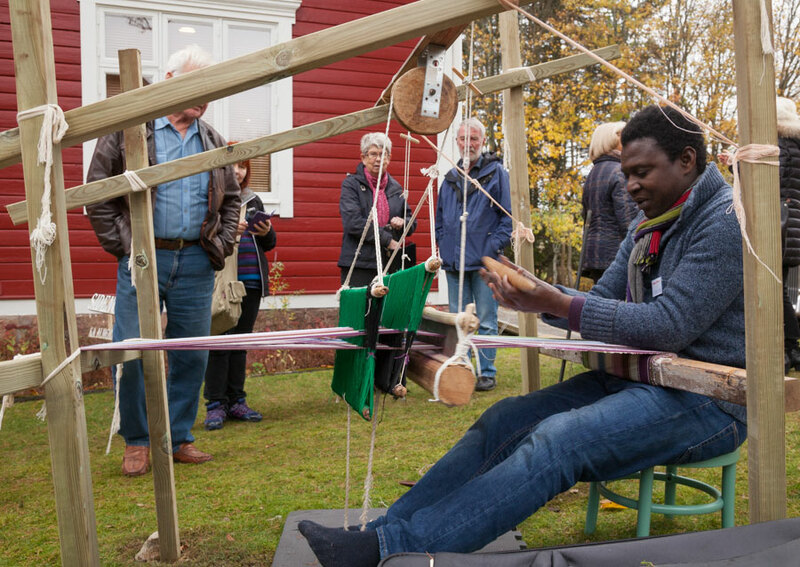 A harp and a loom? 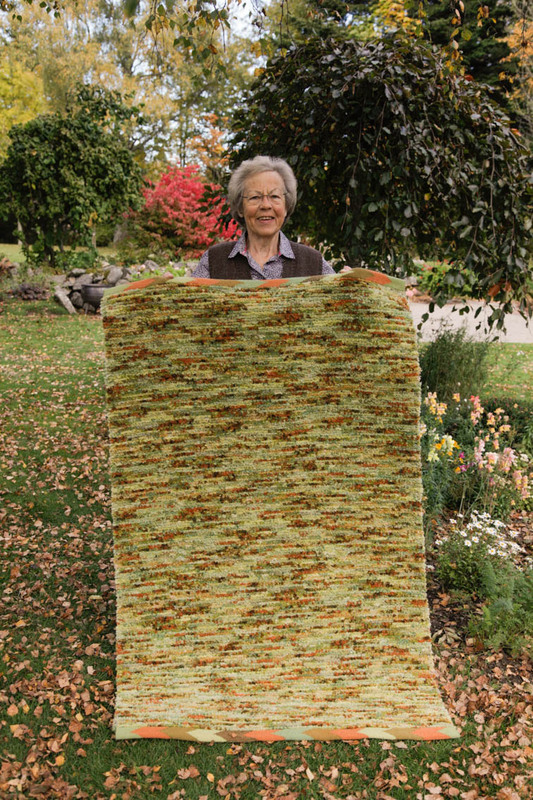 Or, as Jonna Sandell asked in the show “Den flygande skytteln”: What would a carpet tell us if it could speak? What sounds would it make if it could sing? And it’s not over yet. 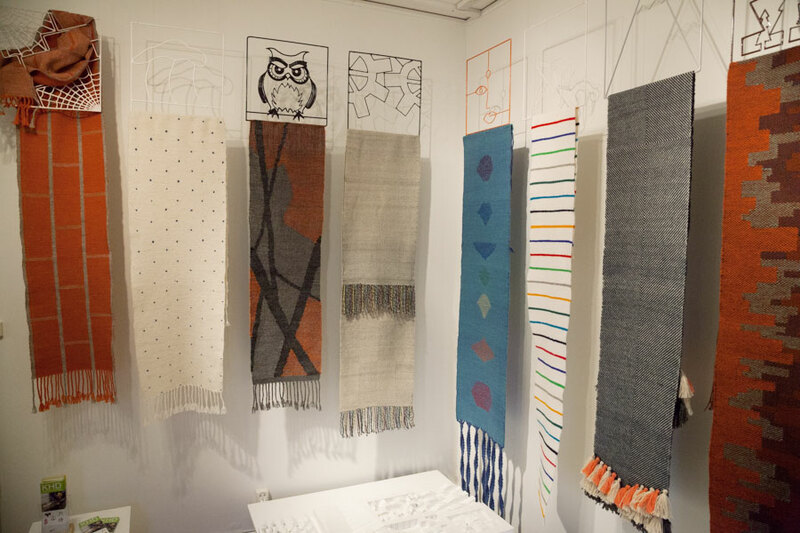 Six pieces from the festival are on display at Textilmuseet until 26 Oct. And look out for The Big Weaving Opera opening in April 2015. Sy tiden. 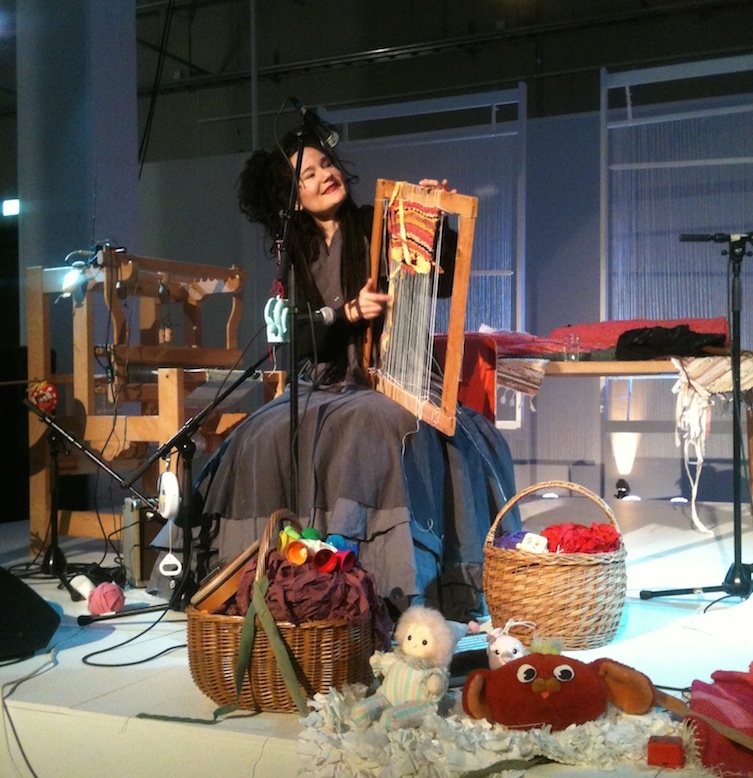 Sewing-machine music by Leo Correia de Verdier, dance Helena Kantinoski. Photo: Stefan Klaverdal. Emma Nordenstam. Photo: Sanna Gustavsson. The Little Weaving Opera by and with Lisa Hansson and Stefan Klaverdal. 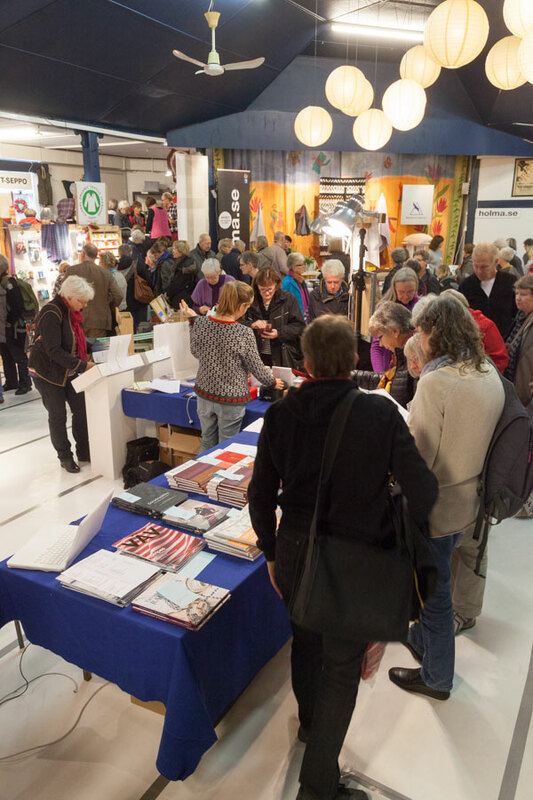 Paulina Nilsson was one of the visitors at Textile Sounds. 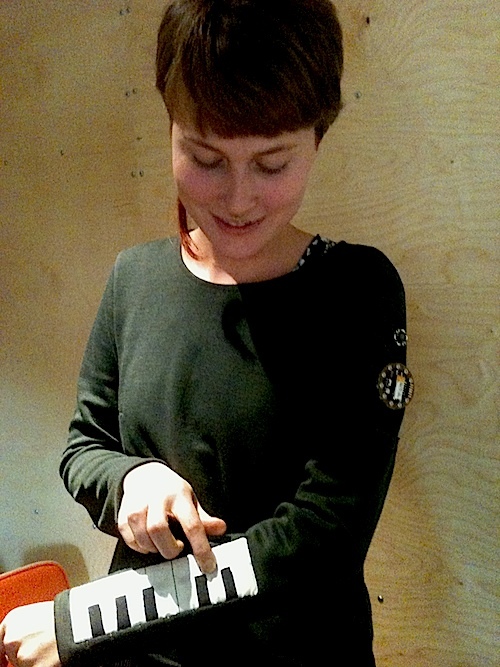 She had made a piano shirt by conductive thread, sensors, a lilypad and a speaker on her shoulder. Photo: Sanna Gustavsson. 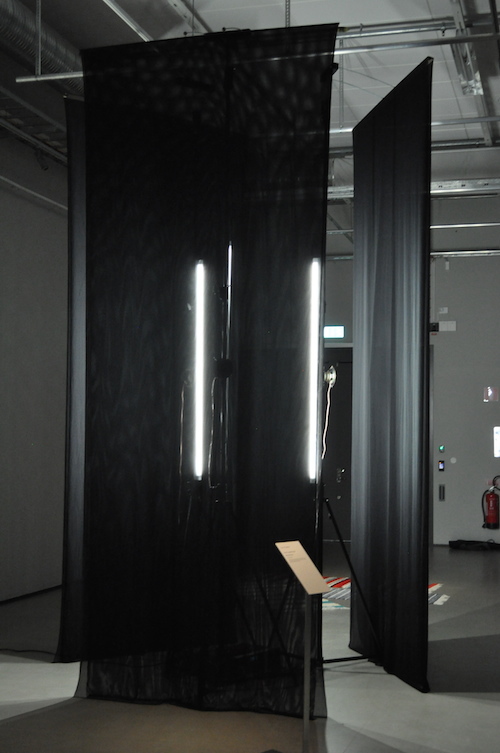 In Thud by Rasmus Persson and Richard Ljungdahl Eklund, electrical signals from a synth produce fluctuations in the membrane of the speaker element, producing soundwaves too low for us to hear. 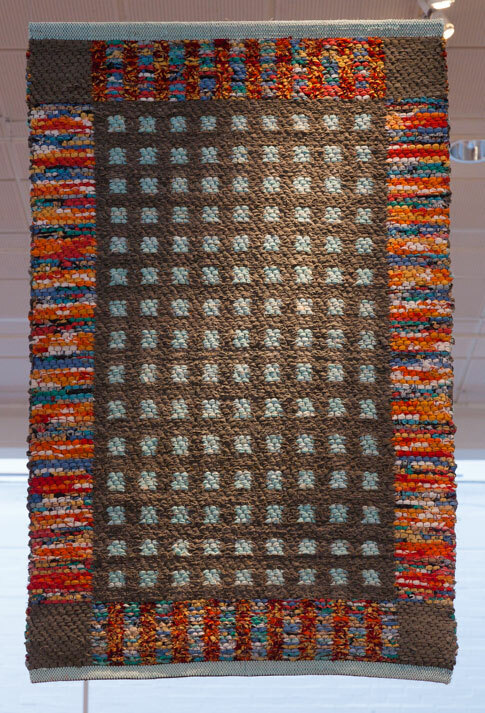 Fishing line connects the speaker element to a piece of cloth, turning it into an even bigger membrane that itself moves about. Photo: Stefan Klaverdal. Picture from the concert with Elsy & The Needle from Syntjuntan. Photo: Stefan Klaverdal. We have had a nice autumn day with Kirstine Packalén in Aneby, Småland, Sweden. 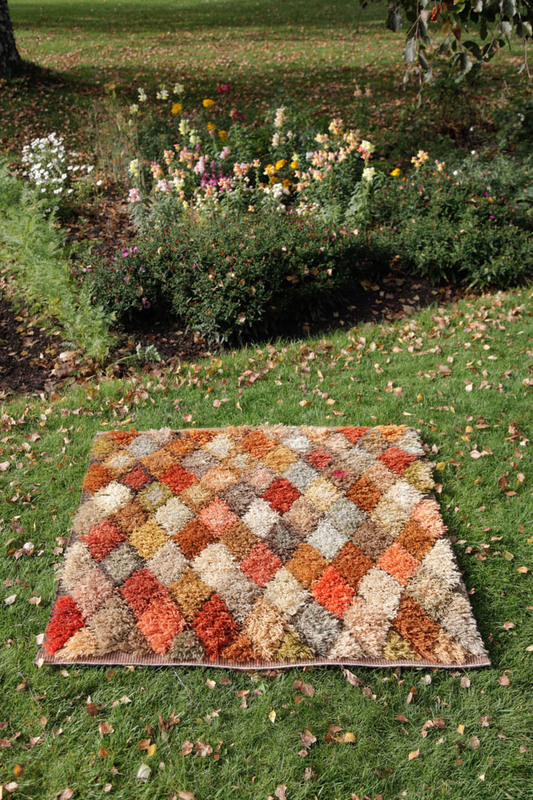 make a rya with a diagonal of each colour. Leave a space = one knot in a diagonal to make the pattern. 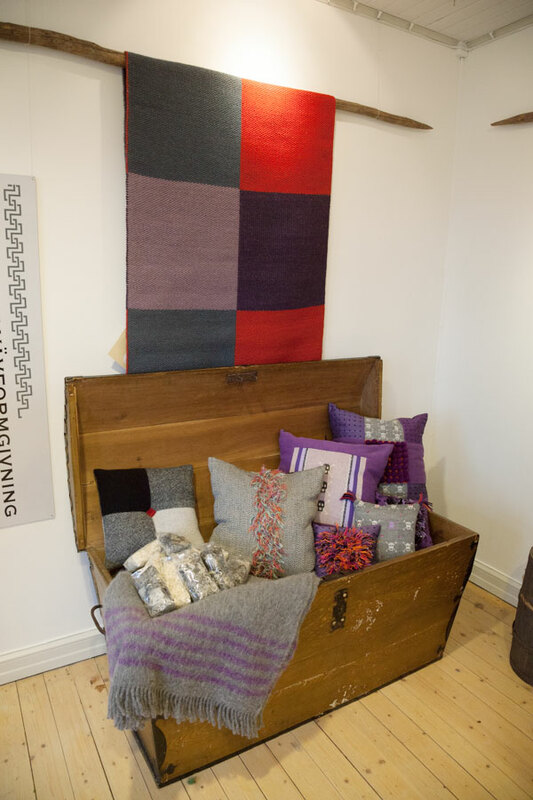 In the next issue 4/14 of Vävmagasinet we show you how. 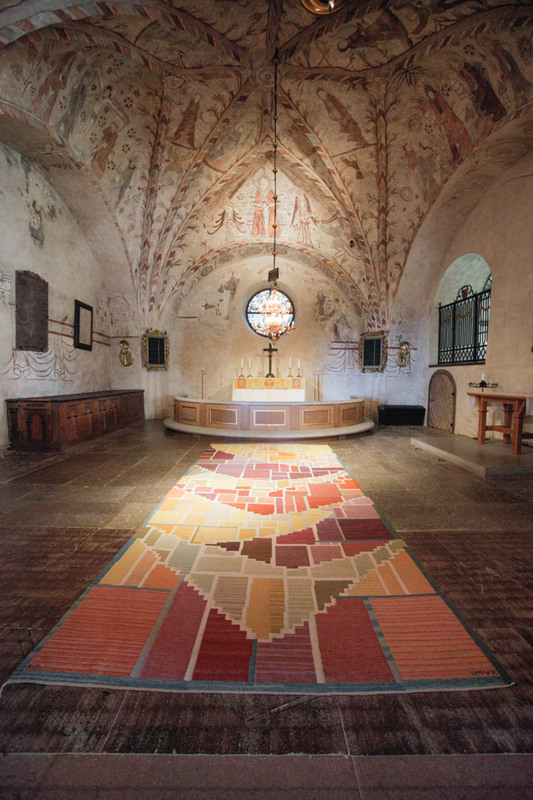 The last picture shows the rölakan rug Kirstine wove to Säby Kyrka, Tranås. Thank you Kirstine for a lovely day! 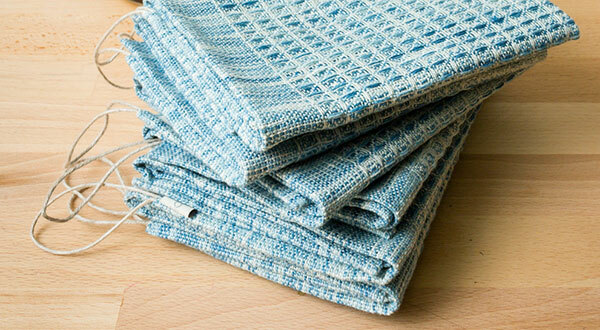 We wich you all a nice “weaving weekend”.